A true-to-life backyard railroad, Ward Kimball’s Grizzly Flats is the inspiration for LGB’s latest locomotive and passenger car releases. Like the original 1995 edition, the cute 0-4-2, known as Chloe, serves as the perfect excuse for taking one’s modeling outdoors to the garden. LGB also produces Grizzly Flats Railroad passenger car models. For those modeling large scale, 2018 marks a very special anniversary for a significant player in the hobby community – LGB is 50 years old this year. It was back in 1968 that Wolfgang and Eberhard Richter of the firm Ernst Paul Lehmann Patentwerk, one of the oldest toy manufacturers in Germany, introduced to the world their Lehmann Gross Bahn – the Big Train or LGB for short. Modeled after European narrow gauge prototypes in a scale of 1:22.5 (twice European O scale) and operating on rails 45 millimeters (1.77 inches) apart, referred to as G-gauge track, LGB trains were like nothing else on the market at the time. Their unique appearance and durable construction became the impetus for moving model railroading from the traditional indoor layout to the backyard garden. While the Big Train phenomenon would eventually branch out to include other scales (1:32, 1:20.3, 7/8, etc.) that utilized the G-scale track gauge standard, which today are encompassed by “Large Scale,” LGB largely stuck with its 1:22.5 ratio size, but has expanded its catalog over the past five decades to include narrow gauge prototypes from around the world. 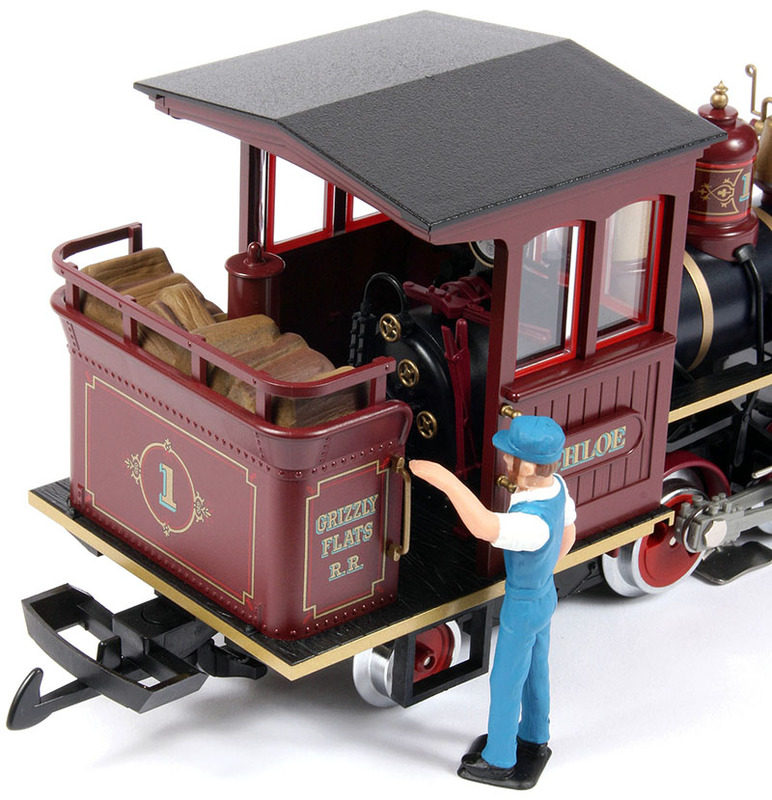 Perhaps one of the company’s most unique offerings to date has been the reproduction of a true-to-life backyard consist once operated by renowned Disney animator Ward Kimball on his three-foot gauge California-based “Grizzly Flats” railroad. 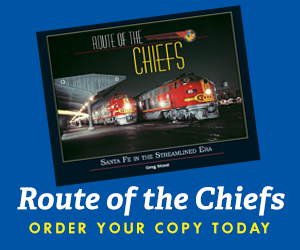 Originally introduced by LGB in 1995 to great fanfare, the whimsically-flavored steam locomotive and passenger cars recently saw reissue in time for LGB’s 50th anniversary celebration. This review will serve as a small glimpse into the many years of magic that LGB has bestowed on model railroading. LGB’s 1:22.5 steam locomotive model is an excellent reproduction of the Grizzly Flats No. 1, now on display at the Orange Empire Railway Museum. The model displays numerous separately applied parts and colorful decoration. Equipped with all-wheel drive and working headlight, the little 0-4-2 is the darling of any garden pike. While Ward Kimball’s work as a lead animator and feature director for Walt Disney is well known, many are not familiar with the fact that he was also a rabid railfan, railroad ephemera and toy train collector, and model railroader too. In fact, this enthusiasm led to Kimball and his family building a three-foot narrow gauge railroad, which he named Grizzly Flats, in their backyard in San Gabriel, California, beginning in the early 1940s. Eventually 900 feet of track would be laid with the railroad’s initial equipment purchased for little more than scrap prices, including an old 2-6-0 steam locomotive from the Nevada Central Railroad that Ward would have rebuilt and christened the Emma Nevada. Operating sessions on the Grizzly Flats would often include the “who’s who” of contemporary railfans, many of whom were employed by Disney or local Hollywood studios. Among these visitors was Kimball’s good friend, movie sound pioneer Gerald M. Best, who would become a prolific rail historian and author in his own right. And, of course, Walt Disney, for whom an invitation to the Grizzly Flats, it has been said, immediately rekindled Walt’s hidden passion for railroads. 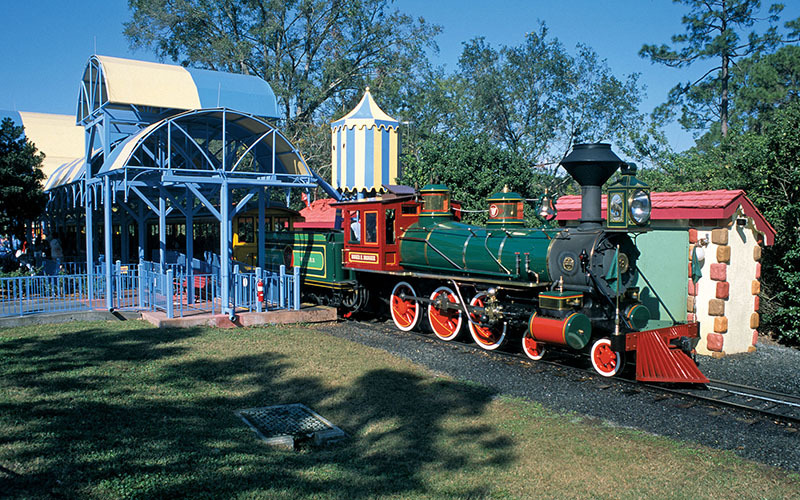 In turn, the visit led Disney to building a miniature live steam railroad on his own estate. The Grizzly Flats experience also receives credit for sparking Walt’s idea for a theme park years later. It would be Kimball’s relationship with Best, however, that would yield Grizzly Flats its second locomotive and one of the subject models of this review. In 1947, the Waimanalo Sugar plantation, located on the southeastern tip of the Hawaiian island of Oahu, began selling off its railroad equipment for scrap. The plantation had operated a small railway for harvesting its sugar cane between 1880 and 1944, but adopted trucking as a more economical method of transporting its harvest directly from the fields to the mill. 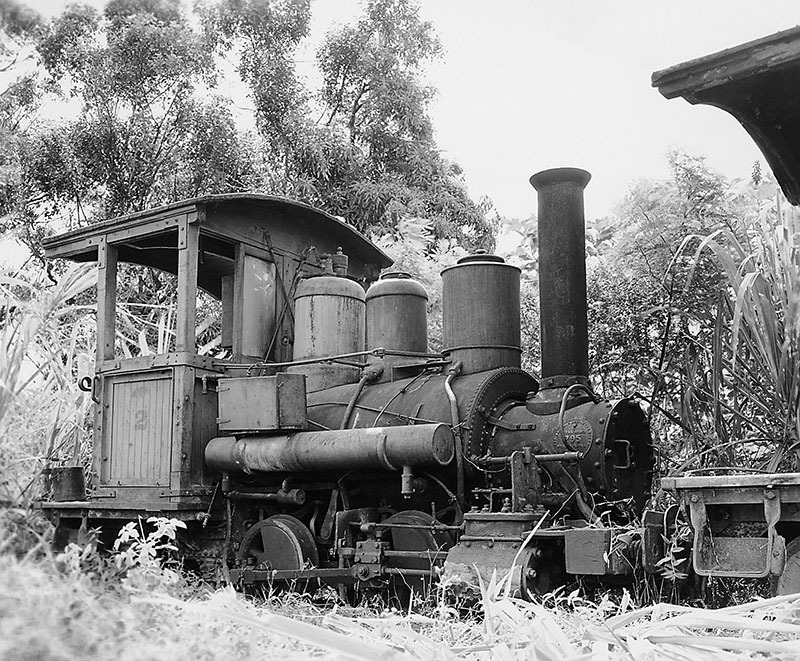 As built by Baldwin back in 1907 for the Waimanalo Sugar Plantation, the future Chloe was a saddle tank engine, officially designated 0-4-2ST, before Kimball had it rebuilt into a rear tank arrangement or 0-4-2RT. Furthermore, it went from being an oil burner to using wood for fuel, thus the wood load exhibited in the tender area. Note the well-detailed backhead, which accurately recreates the bulk of the controls found on the former plantation engine. The Waimanalo motive power roster had consisted of four 8-ton oil-burning saddle tank 0-4-2 steam locomotives built by Baldwin. These were rather lightweight locomotives when compared to the equipment operated by the other plantations on the Hawaiian Islands by the late 1930s. The Waimanalo had relied heavily on portable track sections laid each season over the characteristic wet muddy soil leading to the harvest areas, so weight always remained an issue for the small railroad. By the late 1940s, the tiny idle steamers were in poor condition and in need of much care, if they were ever to see service again. Gerald Best apparently had a soft spot in his heart for the little tank engines as he ended up purchasing two of the Hawaiian steamers, the former No. 3 Olomana for himself and the No. 2 Pokaa for his friend Kimble. The older of the two locomotives, built in 1883, the Olomana would retain its saddle tank configuration and eventually be converted to a wood burner. The Olomana operated for many years on the Grizzly Flats before Best donated it to the Smithsonian Institute in 1977. The steam locomotive is currently on loan to the Railroad Museum of Pennsylvania in Strasburg, Pennsylvania. Meanwhile, the 1907-built Pokaa would see its boiler raised off the frame, the water tank removed from around the boiler in favor of a small tank placed behind the cab, and it too was converted to burn wood (no doubt at the behest of Kimball’s neighbors who had complained about the coal burning Emma Nevada in the past). All gussied up in a bright paint scheme befitting Kimball’s colorful personality, she would be renamed the Chloe after Kimball’s daughter and carry the one-spot on the Grizzly Flats’ roster. 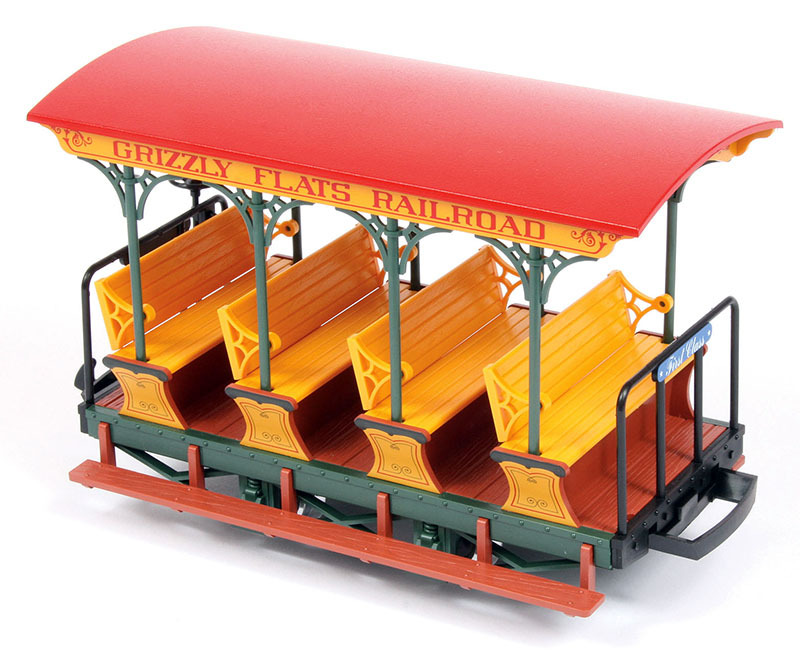 LGB offers reproductions of Grizzly Flats second- and third-class passenger cars, Nos. 5 and 6 come as a two-pack release. These models are authentic reproductions of Ward Kimball’s home-built cars assembled in 1993. They are rather simple cars to replicate, but, being LGB, still display a generous amount of detail and add-on parts. With the Emma Nevada sidelined due to mechanical issues, the Chloe would soon become Kimball’s primary locomotive. Over the ensuing years, he added some home-built rolling stock that was more appropriate for pulling behind the little steamer, including an open air passenger car with roof he dubbed Grizzly Flats’ “First Class” car, as well as a pair of four-wheel gondolas with simple bench seating that were lettered up for second- and third-class accommodations. Kimball would continue to operate Grizzly Flats until his death in 2002 with his family maintaining the railway for a few years thereafter. In 2007, at the wishes of the Kimball family, the entire equipment roster was donated to the Orange Empire Railway Museum in Perris, California. Hoping to both restore and return the Chloe to regular operating status, LGB/Märklin and the museum are sponsoring a fund drive, known as the C59 Chloe Fund, so that the Grizzly Flats equipment can once again be enjoyed by railfans visiting the prestigious museum from all over the world. While it might be the dream of every railfan to have their very own similar life-size pike in the backyard, LGB provides a scaled-down experience of Ward Kimball’s Grizzly Flats perfect for fun in the garden. This large scale tribute to Kimball’s famous railroad is just as eye-catching as the real deal. Comparing the 1:22.5 scale equipment to prototype photos, LGB has done a pretty good job of visually matching Chloe and its varnish in general proportions and in its many nuances. It’s also interesting to note that in an era when most ready-to-run trains have “Made in China” stamped on the bottom of them, many G-gauge models continue to be produced in Europe, with the little steam locomotive and cars in particular coming from LGB/Märklin’s manufacturing facilities in Hungary. Grizzly Flats first-class car, No. 7, is reminiscent of the traditional open-air excursion cars made popular by some Eastern roads around the turn of the 20th century. Featuring cross-bench seating with reversible backs, this four-wheel car often operated as the observation car at the rear of the three-car consist. Reproduced for operation on G-gauge track, LGB has done a superior job of recreating all the nuances of the original right down to its colorful paint and lettering scheme. Admittedly, I was unable to find any dimensioned drawings specific to the rebuilt locomotive and homemade rolling stock, but I did come across a diagram and general data regarding the as-built Baldwin 0-4-2 delivered to the Waimanalo in 1907. Accordingly, the 13,000-pound saddle tanker displayed 24-inch diameter drivers, a 44-inch driver wheelbase, an overall wheelbase of 108 inches, operated at a boiler pressure of 130 pounds, was equipped with 7 x 10-inch cylinders and Stephenson valve gear, and produced a tractive effort of 2,256 pounds. In turn, the 10-inch long (from tip of pilot to the end beam) LGB steamer mimics the correct overall wheelbase closely at 4.75 inches long, as well as the proper driver spacing. The drive wheels, however, measure about an inch-and-a-half under the prototype’s in order to counter the larger flanges used on the LGB wheels. Nonetheless, the drivers do display attractive red-hued see-through spokes and counterweights. One improvement I noted in this area of construction versus the original 1990s release is LGB’s use of a metal wheel set with red nylon center inserts in the trailing truck instead of the former all-plastic wheel set, which was simply molded in red. Not only does this upgrade improve the visual appeal of the model, but also the locomotive’s tracking abilities. Other changes to the 2018 edition appear to be more cosmetic in nature. The boiler is now painted a very dark Navy Blue rather than the medium metallic blue color of the past. And the various polished brass features of the prototype, once rendered in shiny plated plastic, come across much more subdued in their molded-in or painted brass-like color. Otherwise, the 1:22.5 Chloe has retained its classic LGB appeal and rugged construction, which includes the use of ultraviolet-resistant engineered plastics for durable operation outdoors. With the bottom assembly removed, you can view the unique belt drive system utilized by LGB on its Chloe rendering. The cogged belt interacts with the gearing on the two-drive axles, while the rear wheel is geared directly to the motor. Also visible are the sprung slide shoe contacts attached to the gearbox plate, which aid the four drive wheels in collecting current from the track. Similarly, the reissued model steam locomotive displays the manufacturer’s usual generous helping of separately applied parts. These include: whistle, pop valves, and bell; smoke box supports, open-slatted pilot, and drawbar; headlamp, smokestack, and the various piping on the boiler; simulated Stephenson valve gear with detailed side rods and slide valves; a very good reproduction of the prototype’s backhead with readable steam pressure gauge face, hand valve wheels, boiler water level sight glass, Johnson bar, and throttle; glazing with bright red painted frames installed in the cab window openings; handholds and stirrup steps on either side of the cab; and a painted wood load in the fuel bunker along with a water fill hatch atop the rear mounted tank. Even the add-on walkways running alongside the boiler and the floor plate, supporting the cab and tank, appear are mounted with molded-in wood grain finishes. The rolling stock follows suit as well. Take the first class sightseeing car, for example. It’s assembled from a separate wood-grain finished floor insert; a chassis with side sill details and integral sideframes, which exhibit standard friction bearing journals and coil springs; has running boards mounted to either side – also showing a wood grain finish; end sills with railing; an add-on brake wheel and staff on the B-end of the car; four cross-bench seats with reversible backs, so passengers can always face the direction of travel; and a curved roof displaying interior framing, letter boards, and separate side pole supports with fancy mounting brackets. Meanwhile, those second- and third-class cars built around gondola bodies are not to be ignored with their similar chassis and sideframe construction; separate floor, side and end wall assemblies; lengthwise bench seating inside; and add-on brake wheels, handholds, and steps rounding out their appearance. All three cars share the same basic length over end sills of 6.5 inches and, like Chloe, are also constructed from UV safe plastics. The gondola models tip the scale at 9.8 ounces each, while the open-air car weighs 13 ounces. 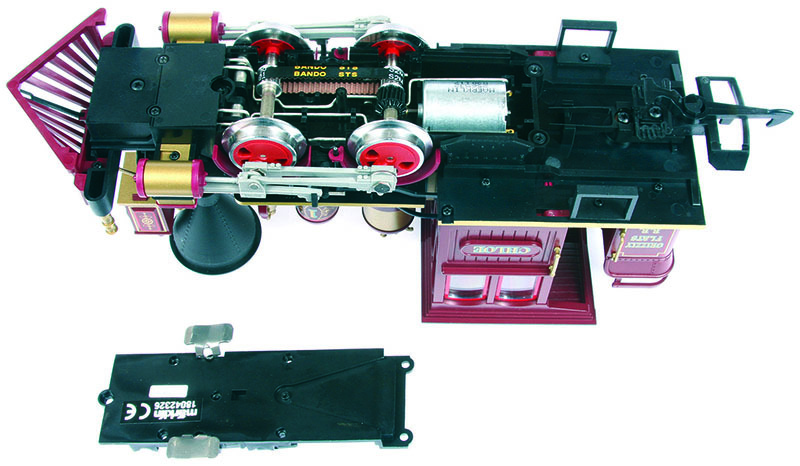 Typical of the construction of all three pieces of Grizzly Flats varnish, the second-class car model displays a separate sill plate with integral sideframes, onto which metal wheel sets snap into their journal housings. 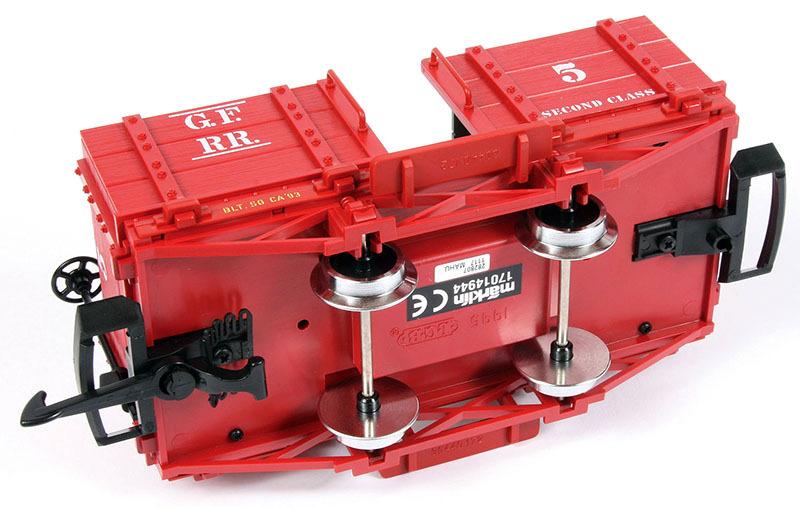 The hook-and-loop coupler system attaches to the sub floor, while a metal weight is hidden in the raised section of the chassis, which is visible between the axles. These are durably-constructed cars that are especially easy for young modelers to place on the track and operate. Although it appears the various components making up these models are either molded-in color or painted, the overall satin finish on the assembled consist is first rate. Additional graphics, such as the lettering or the intricate filigree striping found on the locomotive and first-class car, are very well executed. Perhaps the weakest link in the decoration category and a holdover from the original release, though, is the use of a factory-applied printed sticker wrapped around the sand dome on the steam locomotive. A difficult part no doubt to decorate with both the road number and fancy striping, but the sticker remains a bit of a distraction, especially where its overlapping edge doesn’t quite burnish down all the way. The paint and lettering, in general, do accurately reflect the real Grizzly Flats equipment in color selection, car numbering, reporting marks, and even the reproduction of the builder’s plates on Chloe. In the operations category, the motive power is a bit of a stand-out with its non-traditional drive mechanism. In order to accurately maintain visual clearance between the chassis and boiler, the ball bearing-equipped can motor powering the model needed to remain practically in the same plane as the drive axles themselves. As such, it wasn’t so much an issue to gear the motor to the rear axle as it was to transfer power to the lead drivers. In a smaller scale, the side rods would be the means to accomplish this feat, but with a much larger and heavier locomotive, this method would not do. So LGB engineers turned to using a cogged belt drive system to transfer axle rotation from the rear axle to the forward axle. In turn, these metal axles include metal gears on which the belt rides, while the rear axle also contains a friction-fitted nylon gear to mate up with the brass spur gear attached to the motor shaft. This same drive system was -used on the original release, as well as on LGB’s Olomana and a number of the manufacturer’s small German railway prototype diesels and steam locomotive models. While a few large scalers have been somewhat dissatisfied with this design in the past, citing belt failures in particular, my personal experience with the older releases over the years has been an overall positive one, and, likewise, I found this latest release to be a solid performer during my testing. Whereas these little gems are smooth performers under standard direct current (DC) power (note: LGB has surprisingly not upgraded this reissue to Digital Command Control-ready status) with a speed range of about 4 scale miles per hour at 2.5 volts to 51 miles per hour at a maximum of 20 volts, they are not stump pullers by any means and are best suited for short lightweight consists, as were the prototypes. Chloe had no difficulty with its charge of Grizzly Flats varnish, but without the use of any traction tires and relying completely on its strategically placed internal weights for traction, the 32.3-ounce 0-4-2 is pretty much limited to a half dozen cars of similar size on level track. Trying to pull a larger train and I can see where the drive mechanism could easily be tasked beyond design. Both the locomotive and cars are outfitted with LGB’s standard hook-and-loop couplers – the locomotive includes a rear frame-mounted coupler only. While the Grizzly Flats prototypes actually utilized link-and-pin couplers, the hook-and-look couplers are much easier to operate. Nevertheless, the modeler could adapt LGB’s link-and-pin coupler system (#64777) to this equipment, if desired for complete authenticity, with relatively little effort. I also found the metal wheel sets equipping the three passenger cars to be free rolling and like the locomotive all axles were properly gauged, offering flawless operation on my test layout that included minimum R1 600-millimeter (23.6-inch) radius curves and turnouts. Chloe has an operating headlight to illuminate the tracks ahead, and the model includes LGB’s traditional engineer figure clad in blue overalls and cap, ready to be installed in the cab by way of the enclosed double-sided tape. In this 1946 photograph by Kent Cochrane reproduced in Gale E. Treiber’s Hawaiian Railway Album: Volume 3 – Plantation Railways on Oahu (The Railroad Press, 2007), we see the Waimanalo’s No. 2 Pokaa after the sugarcane plantation abandoned its railway equipment in favor of trucking. This would pretty much be the condition in which Best and Kimball would have purchased the 0-4-2 and sister Olomana a year or so later. Pokaa later saw transformation into Grizzly Flats’ Chloe, as modeled by LGB. Thanks to LGB’s original Grizzly Flats releases more than 20 years ago, I first became aware of Ward Kimball’s amazing backyard railroad and, in turn, the Chloe’s Hawaiian heritage and then everything pertaining to small plantation railroads. Yes, the Chloe and its consist basically opened up a whole new world of railfaning to me, including a foray into large scale and narrow gauge modeling. That initial excitement and wonder continues to be present in LGB’s 50th anniversary reissue of these whimsical renderings as well, which will no doubt plant the seeds of inspiration in yet a new generation of railfans who await the discovery of their own rewarding niche in this great hobby. Chloe’s Hawaiian origins as well as additional information on plantation railroads in the 50th U.S. state can be found in Gale E. Treiber’s Hawaiian Railway Album: Volume 3 – Plantation Railways on Oahu (The Railroad Press, 2007). 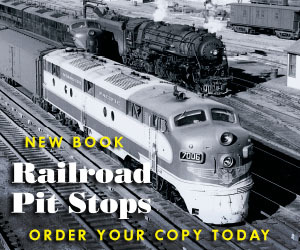 Based on the photographs taken by various World War II servicemen stationed in Hawaii during and right after the war, the full four-volume series provides a wonderful history of railroading on the islands with brief histories of the numerous operations, detailed captions, motive power rosters, maps, and gorgeously reproduced black and white photos. LGB, distributed by Märklin, Inc.